IBM scientists have created artificial neurons and synapses using phase change memory (PCM) that mimics the brain's cognitive learning capability. It is the first time the researchers were able to create what they described as "randomly spiking neurons" using phase-change materials to store and process data. The discovery is a milestone in developing energy-sipping and highly dense neuro networks that could be used for cognitive computing applications. In short, the technology can be used to improve today's processors in order to perform computations in applications such as data-correlation detection for the Internet of Things (IoT), stock market trades and social media posts at a staggeringly fast rate. The results of IBM's research, "Stochastic Phase-Change Neurons," is 10 years in the making and appeared today on the cover of the peer-reviewed journal Nature Nanotechnology. IBM Fellow Evangelos Eleftheriou said it will still be "several years" before the market would see a PCM processing chip. But the recent discovery is a critical breakthrough in their development. Inspired by the way the human brain functions, scientists have theorized for decades that it should be possible to imitate the versatile computational capabilities of large populations of neurons. However, doing so at the densities and miniscule voltage comparable to biological systems has been a significant challenge -- until now. 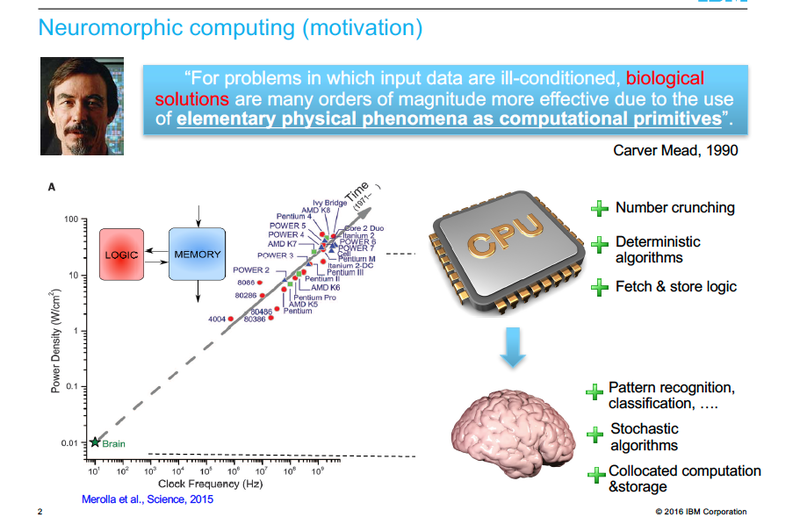 Key to the technology is the artificial neurons' random variation or "stochastic" or random behavior. In statistics, a random variable can be used to determine possible outcomes in data analytics; in other words, it can determine the likelihood of data correlations. "Basically, it operates how the brain operates, with short voltage pulses coming in through synapses exciting neurons," said Tomas Tuma, lead author of the paper and a scientist at IBM Research in Zurich. "So we use [a] short pulse of, say, nanosecond duration...to induce change in the material." 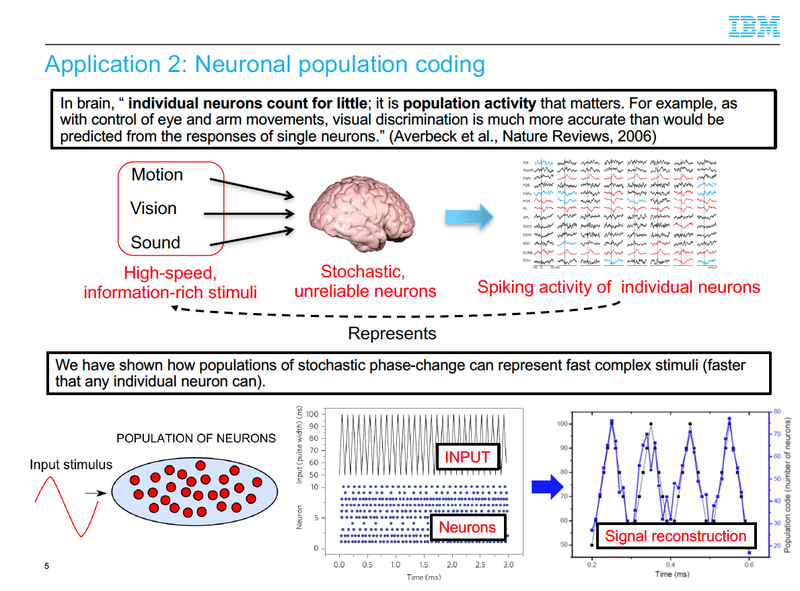 The PCM's stochasticity, Tuma said, is of key importance in population-based computing where every neuron responds differently and enables new ways to represent signals and compute. "Normally, people try to hide [stochasticity], or if you want good quality stochasticity you have to induce it artificially. Here, we have shown we have a very nice stochasticity natively because we understand the processes of crystallization and amorphization in phase-change cells," Tuma said. The phase-change artificial neurons being created today are just 90 nanometers (nm) in size, but the researchers said they have to potential to shrink the process to as small as 14nm in size (a nanometer is one billionth of a meter). IBM researchers have organized hundreds of artificial neurons into populations and used them to represent fast and complex signals. The artificial neurons have also been shown to sustain billions of switching cycles, which would correspond to multiple years of operation at an update frequency of 100 Hz. The energy required for each neuron update was less than five picojoule and the average power less than 120 microwatts. By comparison, it takes 60 million microwatts to power a 60-watt lightbulb. A depiction of a phase-change neuron and the two states it exists in: crystaline (ordered) and amorphous (random). The artificial neurons would be used to create neurologic processors that could reside side-by-side and compliment standard processors, offloading analytics-intensive workloads, according to Tuma. "We show we can have both synapses and neurons using phase change cells," Tuma said. "The discovery is important in taking phase change memory to the next level and to use it for computations." PCM, which is also known as phase-change random access memory (PRAM) is a form of nonvolatile memory based on using electrical charges to change areas on a glassy material from crystalline, or an ordered, state to amorphous state, where its atoms are randomly distributed. By applying spikes of voltage, the PCM's state can be switched back and forth, which can be used to represent ones and zeros or bits of data. PCM, however, can exist in more than two states, not just zeros and ones. Companies such as IBM, Micron, Samsung and Everspin have been experimenting with PCM as a type of non-volatile memory because it offers up to 100 times the performance and vastly better endurance over NAND flash. Because it is expensive to make, to date it has yet to see significant market uptake. PCM also doesn't suffer the data corruption issues associated with NAND flash that stores multiple bits per cell. However, the latest research is not associated with creating a new non-volatile memory. Instead, PCM is being used to create a new type of processor. "We have been researching phase-change materials for memory applications for over a decade, and our progress in the past 24 months has been remarkable," said IBM Fellow Evangelos Eleftheriou. "In this period, we have discovered and published new memory techniques, including projected memory, stored 3 bits per cell in phase-change memory for the first time, and now are demonstrating the powerful capabilities of phase-change-based artificial neurons." The artificial neurons consist of phase-change materials, including germanium, antimony and telluride. The materials are the basis of re-writable Blue-ray discs today. However, the artificial neurons do not store digital information; they are analog, just like the synapses and neurons in our brain. 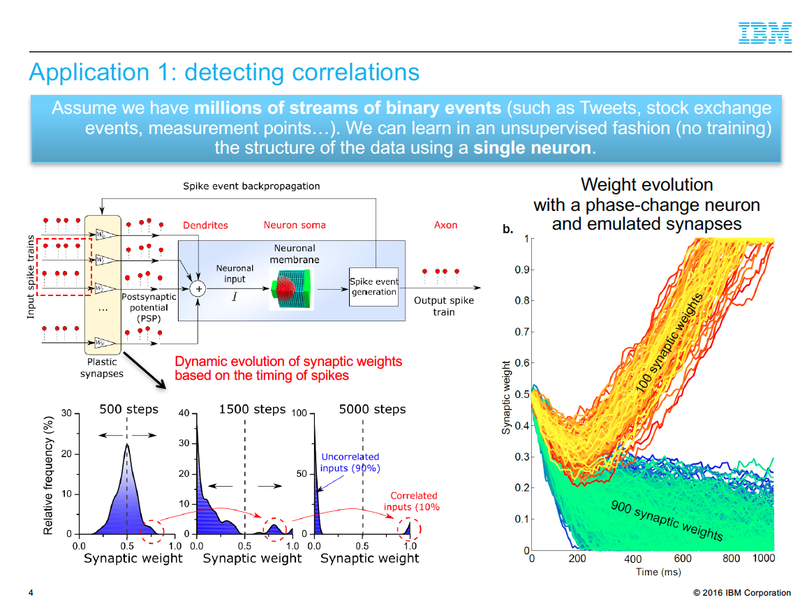 Exploiting this integrate-and-fire property, even a single neuron can be used to detect patterns and discover correlations in real-time streams of event-based data, the researchers said. For example, in the Internet of Things, sensors can collect and analyze volumes of weather data collected at the edge for faster forecasts. The artificial neurons could also detect patterns in financial transactions to find discrepancies or use data from social media to discover new cultural trends in real time. Large populations of these high-speed, low-energy nano-scale neurons could also be used in neuromorphic coprocessors with co-located memory and processing units. What also makes IBM's artificial neurons special is they can achieve a level of self-learning and could be used for power-hungry applications such as data analytics, which could detect random patterns in social networks such as Twitter or a stock market. For example, if one stock is traded on an exchange, it could have an effect on others in ways not easily discernible. Eleftheriou used "the diapers and beer" predictive analytics urban legend to explain how machine learning enabled by artificial neurons would work. The legend contends that a study performed by a grocery store found a correlation between men who bought diapers and beer sales. While not readily apparent, the study found men buying diapers felt compelled to balance their nurturing, feminine side with a manly beer purchase. The study's findings, the legend contends, prompted the grocery store to move the beer closer to the diapers, which resulted in a 35% increase in sales of both. Other grocery stores followed suit. "Using the artificial neurons, you can also find correlations between two stocks, which you and I may think, 'How are these two stocks connected?'" Eleftheriou said. "We don't know why it's happening, but the data says it is happening and the synapses can show that correlation."